Product prices and availability are accurate as of 2019-04-10 19:27:25 EDT and are subject to change. Any price and availability information displayed on http://www.amazon.com/ at the time of purchase will apply to the purchase of this product. This Linemaster 632-DA Clipper 10 amp, 250V/20 amp, 125V, 1.5 HP foot switch has a cast iron housing, non-skid base, and an adjustable strain-relief clamp. This foot switch is suitable for use in applications in which users need hands-free, on-and-off power activation. The foot switch provides single-stage, maintained action for push-on/push-off activation and termination. It has a cast iron body for strength and durability and bolt holes for mounting to the floor or equipment. The non-skid base gives the foot switch stability to help prevent sliding on smooth floors. An adjustable strain relief clamp protects the cord (not included) from damage caused by pulling or stretching. 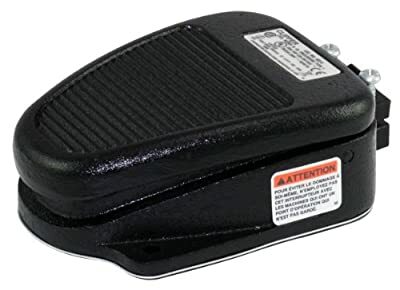 This foot switch is certified by the Canadian Standard Association (CSA), meets United States Underwriters Laboratories (UL) standards for quality assurance, meets European Conformity (CE) product compliance safety standards, and has an Ingress Protection (IP) rating of 20 for protection against small amounts of dripping water and access with a finger. An awareness cover, steel guard, and other accessories are available for this product (contact manufacturer). This maintained operation foot switch is suitable for light-duty applications such as lights, power tools, musical equipment, and others. Foot switches are used to turn on and off electrical devices and may also provide control over the device's speed and mode of operation. They come with up to three pedals and can have a maintained, momentary, variable, or anti-trip switch action. For maintained action switches, one press of the pedal controls the power, whereas momentary action switches require constant pressure on the pedal for power. Variable action switches (also called foot potentiometers) function similarly to momentary action switches, but also provide control over the connected device's operating speed. Anti-trip action switches require users to release a safety latch before pressing down for momentary action. Foot switches vary in their contact specifications, amp ratings, plugs and receptacles, and material construction to suit different applications, device amperages, plug configurations, and environments. Foot switches are commonly used with power tools, sewing machines, musical instruments, dental equipment, and lighting, and in the construction, laboratory, production, and medical fields, among others. Linemaster Switch Company manufactures electromechanical, pneumatic, digital, linear Hall effect, and wireless foot switches for use in the industrial, medical, computer, and musical fields, among others. The company, founded in1952, is headquartered in Woodstock, Connecticut, and meets International Organization for Standardization (ISO) 2001:2008 and ISO 13485:2003 standards.